← Stop! Stop! No really, please make it stop. I’m begging you. Holiday Greetings from the Slattern Family! Well it’s been another amazing year in the Slattern household, and as we prepare to welcome Christmas and ring in the New Year, I wanted to bring all our friends up to date with our many merry mix-ups and crazy goings-on. As some of you may have heard, this year was a tad challenging, owing to Grandma’s conviction in April. Thankfully it was just “time served” and then home with the little ankle bracelet, which is no trouble at all. In fact, we love knowing where she is at all times! Then there was the unfortunate incident with Uncle Fred and his neighbor’s leaf blower over Columbus Day weekend. (Now that the sores have healed, Mr. Evans is a new man!) And finally there was some slight unpleasantness with the IRS, which I’m pleased to report is finally all sorted out. After eight hours in a tiny, overheated office with Mr. Slattern and myself, the nice agent told us we were free to go as long as we took the Pod with all our paperwork in it, Uncle Fred’s flowcharts and Uncle Fred himself with us. No tax fraud, just a misunderstanding after all! As you can imagine, we’ve all been looking forward to some quality family time over the holiday season. So this year I thought it would be fun to put a new spin on that tired old Thanksgiving tradition. Since we’ve all been dying for a Hawaiian vacation, but can’t afford the trip with the liens and penalties still outstanding, I decided to go with a tiki theme right here at home. 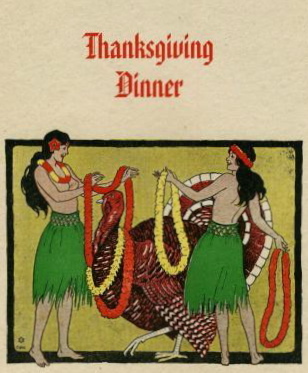 Everyone was very excited for the Thanksgiving pig roast and luau; I have to say Grandma looked pretty fetching in her grass skirt, and the boys loved their nifty Hawaiian shirts. Even Mr. Slattern joined in the fun and dug the roasting pit. That was one frisky pig, but Uncle Fred finally caught him! Owing to some pesky holiday precipitation the pig roast took a little longer than we planned, but by Friday everyone was good and hungry! Very festive…until the flame jumped! 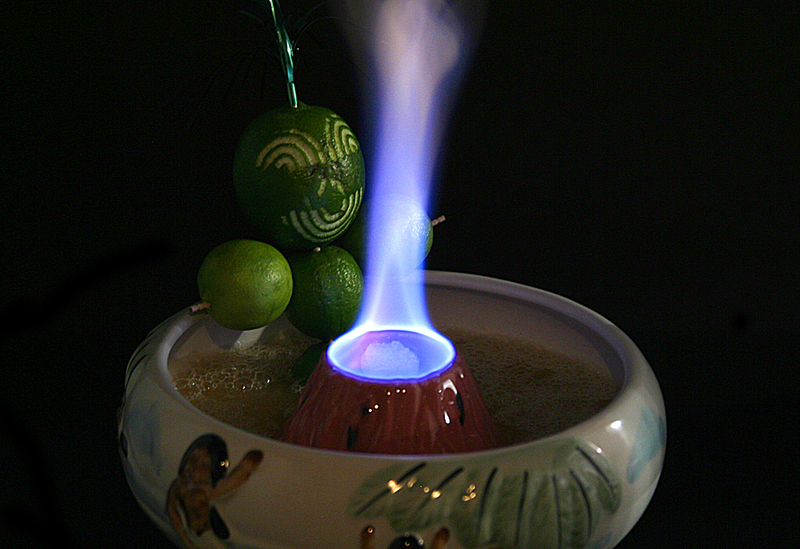 It was a party-ready Slattern family that gathered around the holiday volcano bowl for a little pre-dinner drink, and I know you’ll be relieved to hear that the damage to young master Slattern’s eye from his sister’s flaming straw is not expected to be permanent. I only wish I’d thought to get the flame retardant Hawaiian shirts and grass skirts. Luckily our house was not a total loss – and neither was the neighbor’s! It was a good thing we all remembered to stop, drop and roll! So come Christmas Day it looks like we’ll still be dividing our time between the motel and the burn unit. Lucky me! No big meal to cook this year. As you may have read in the Daily News, donations to the Slattern Family Housing and Legal Defense Fund are still being taken and all are welcome. Posted on December 15, 2011, in Holiday fare and tagged Christmas, Christmas letters, Hawaii, Humor/Commentary, Parody, Pig roast, Volcano bowl. Bookmark the permalink. 4 Comments. Step away from the portable bar…no really, you must!